We were sitting at a cousin’s basketball game waiting for my chatty (ahem… public-relations-building, Catholic Schools marketing coordinating mother) to make her rounds when I asked my dad how to solve my room’s missing wall dilemma. My dad was/is a builder, and I knew he would enjoy sharing his knowledge on the subject. Initially, he suggested constructing a two-by-four framed drywall barrier. A father son project. Unfortunately, drywall is expensive, and kind of a cop-out.There had to be more opportunity lying in this shifty excuse for a third bedroom’s need for a little privacy. But I tried to stick with the wood because 2×4’s were cheap, stable, and perhaps quickest way to solve the problem. It led to a framed wall atop cinder blocks, harnessed by hooks & cables with something translucent… maybe canvas, maybe industrial plastic wrap. After working in construction for family since I was 14, seeing raw materials in an unfinished state seemed like home and would go nicely with the wall’s adjacent exposed brick wall. Often, a passerby sees a building or a home for the sum of its parts, but I wanted the wall to emphasize its parts and make viewers see a home in a skeletal way. 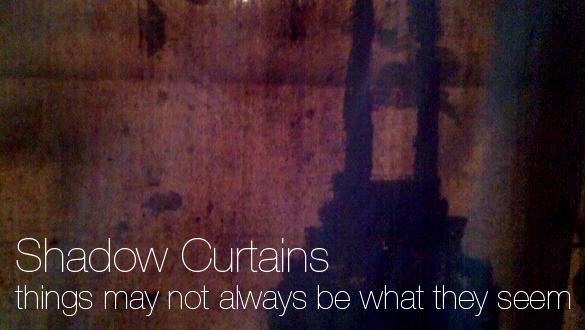 Perhaps the translucent shadow concept came from a curtained Jason Aldean concert entrance I saw last summer, but after living around my curtain wall for a week or two I noticed shadows from my room’s dresser. 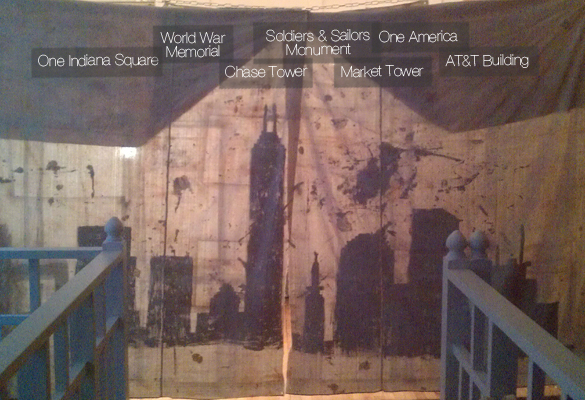 I had my translucent shadow idea, and I felt the Indianapolis skyline would resonate well with anybody visiting our Indy apartment. 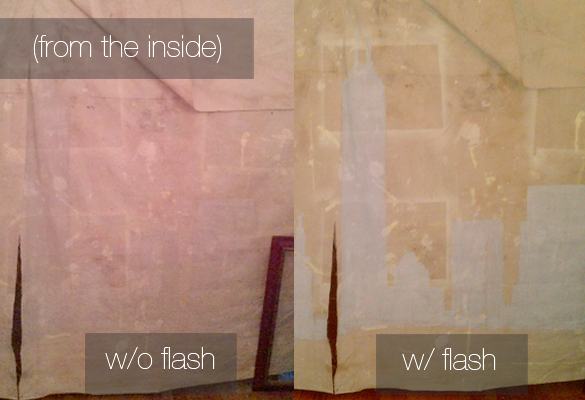 One can hardly see the paint from the inside, but a viewer can see the skyline from either side because the paint blocks light coming from any direction. If a visitor enters through our backdoor, they’ll see this view first and may not notice the skyline until they turn around upon passing through. The skyline as a slightly impressionistic feel with its rounded edges and its patchy painting. If you notice, the start of a shadow on the farthest left is actually from my dresser and may even seem like another building. Something to think about. 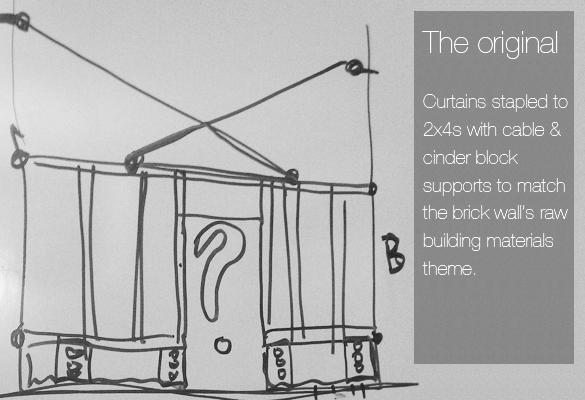 Besides a raw construction materials project, I would do this if I had big enough windows. I’ll leave it to you to take this where you will. 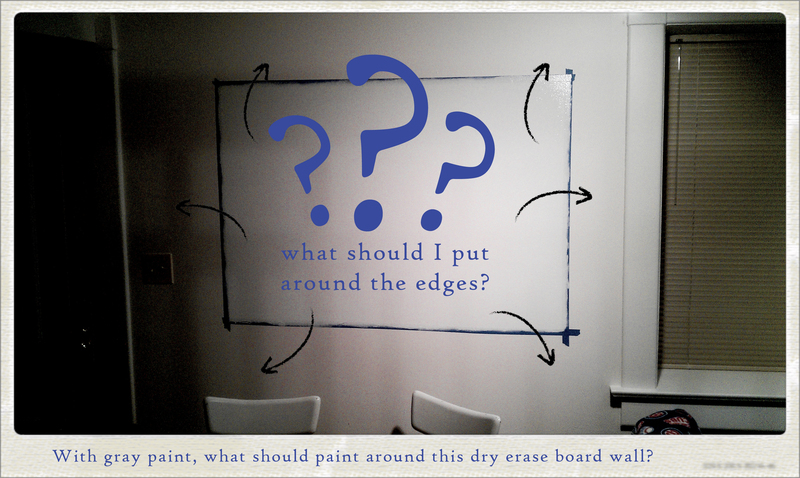 So I had an idea for our apartment – a dry erase board wall. We’ve got stick-able dry erase surfaces in our office walls, and it’s a really unique experience to write on directly on the walls. The only problem is when you erase things, the bordering wall gets dirty. Hence, I need ideas for a border. Since we all know the best finished products come through collaboration, I’m looking to collaborate with your suggestions. I’m using only gray paint for a very neutral feel that won’t overpower my space. Leave your suggestions in the comments below and if I pick yours, you’ll recognize it in the next picture I post. A DIY I did for my work at TravelProducts.com’s blog, this graphic will easily teach you how to make your own travel journal to record your ideas. Inspired by People for Urban Progress. If you like what you see, you can buy a journal here!